Yellowstone & Grand Teton National Parks trip September 2012. No elk in the Madison valley at first light although there were a couple of females in and around the campsite area. After breakfast we drove out toward the west entrance along the Madison River valley and parked up beside the river for a couple of hours. We got the camping chairs out and alternated between sunshine & shade. I photographed a few birds which I've yet to identify and then Linda spotted some more otters porpoising upstream right in front of us. 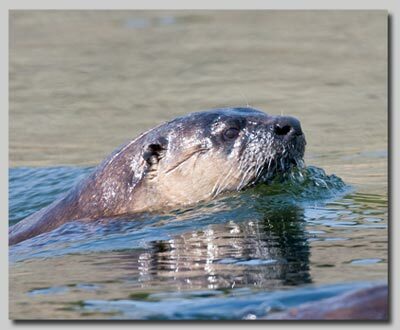 There were 4 individuals and as I followed them upstream into calmer waters they got curious and came close to investigate me. I got some nice close-ups of them as they surfaced. After lunch we drove up through the Firehole canyon and then on toward the geyser area at Midway Geyser. It was very hot and most wildlife seemed to be keeping in the shade. We later drove out to the west again where I'd been told there was a bull elk with a few cows near the road but probably in the shade. My tip-off was correct and we saw a bull with 11 cows in the meadow although they were too far for serious photography and there were a lot of people & vehicles around as it was a Saturday. We finished the day with a few steaks on the fire and then sat around the campfire with a few drinks! I was out at about 7:30 and found 2 bison in the meadow below the campsite although smoke from forest fires was all around. There were a couple of bull elk bugling down the valley but they never broke the tree line so I never got to see them. After breakfast we drove up toward Norris and then onto Canyon junction. We bought a few souvenirs and a phone card as mobile service was very limited in the park and we needed to call Arran to wish him a “Happy Birthday”. 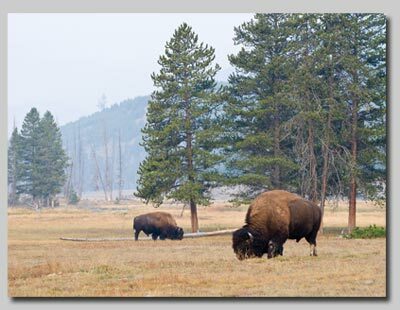 We then drove on down through the Hayden valley where we saw many herds of bison on the open plains area of the valley and also on the slopes toward the trees. We had our lunch beside the vast Yellowstone Lake and you could be forgiven for thinking that you were beside the ocean as we couldn't see the far shore. There was a fantastic adult Bald eagle in a pine near Steamboat Point and after a few 3 point turns I still failed to get a photo as he flew before I could get the lens on him. I collected some driftwood from the shoreline for tonight's campfire and we headed back toward Norris. In the Hayden valley we stopped for a few photos en-route until we saw a large bull bison heading down from the opposite shore toward the river. 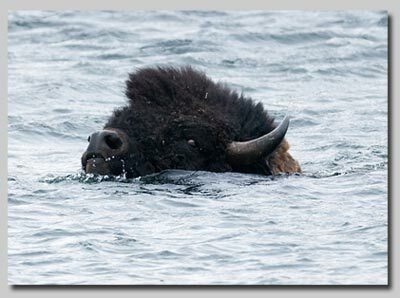 I got out and set the big lens on him and then photographed him as he entered the river and then swam across with just his head breaking the water surface. He then got to our shore and stood and shook off the excess water before crossing the road and heading for the tree line. 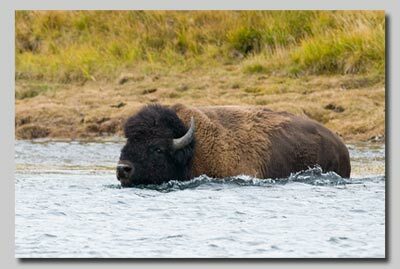 A Bison bull swimming the Hayden river. We got back to the Madison campground at about 5 and I got the BBQ going and had a quick shower before eating and drinking amongst the smoke of dozens of campfires and the pleasant aroma of the pine forest. Our 35th wedding anniversary and what better place to spend it than Yellowstone! We left Madison early and headed north toward Norris and then on to Mammoth as the road from Canyon village over Dunraven Pass to Tower was now closed for repair as it was approaching the end of the season and would then remain closed until the spring. We stopped for breakfast watching a herd of elk along the Gardner River on the plateau before dropping down into Mammoth. Elk on the plateau above Mammoth Hot Springs. There were 13 elk cows and no bull in sight although they looked very wary and the lead cow was always sniffing the air and looking around in all directions. Eventually they disappeared into the trees. In Mammoth there were the usual elk dotted around the lawns of the various ranger houses and there was a single bull in a meadow on the road toward Tower. We headed on toward the Lamar valley because we knew that the only campsite left open in this part of the park was Slough Creek (pronounced Slew!) and if we wanted to get a pitch we had to be there in good time as there are only about 20 sites in total. Just before we got to Tower-Roosevelt junction we met a lot of people parked up and we stopped and watch a black bear mum with 2 cubs. They were fairly distant but it was a great sight and oddly enough it was exactly the same spot that we watched 2 black bears about 10 years before. (This area is always good for seeing black bear as we watched one again near here a few days later). We moved onto Slough Creek and took the horrendous gravel road into the site which is about 3 miles long and corrugated with ruts that shake you and the vehicle to pieces. Fortunately I spoke with some people that were just about to leave and took their pitch which was the only one left. A great site with the river next to the BBQ pit and I watched 2 dippers amongst the boulders in the stream as we ate our lunch. The campsite at Slough Creek in the Lamar valley. At about 3:30 we drove along the Lamar valley and there were hundreds of bison on both sides of the road and often in the road. Not far down the road I noticed a few people looking to the river and I then spotted a lone coyote. It was grey and had a tracking collar around its neck. I got a few distant pictures, especially when it sat down for a scratch. From examining the photos later it looks as if it has mange on it's right flanks and belly so understandable why it spent a lot of time scratching! 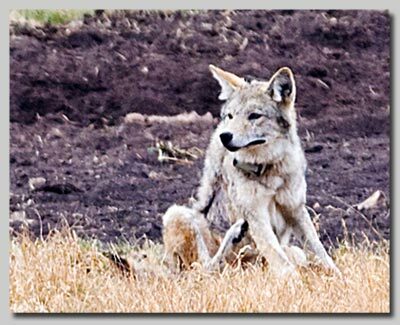 Long distance photos of a coyote with radio tracking collar in the Lamar valley. Farther down the valley we could see a storm approaching but it missed us when we diverted up the valley toward Soda Butte and Pebble Creek. Here we spotted 3 moose, a bull, cow calf. They were grazing in the marsh on the far side of the river. It was good to see as we'd not seen moose in Yellowstone before. A little later the storm caught up with us and a bolt of lightning and clash of thunder heralded a downpour. BBQ's are out tonight so will have to eat indoors later. A shame because the previous occupants of the campsite had left me a heap of tinder dry logs for the fire. On the road at about 8:30 we headed down the Lamar valley to see what the night had brought for its inhabitants. There was a coyote stalking the sagebrush just before the Ranger station and we stopped for coffee there and just watched for any action. 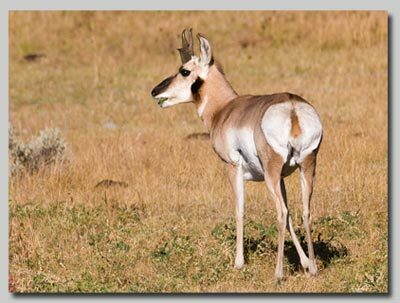 Several hundred bison were roaming around the area and Pronghorn antelope also grazed down near the river. There were lots of fishermen on the river and each layby/turnout was full of their parked cars. 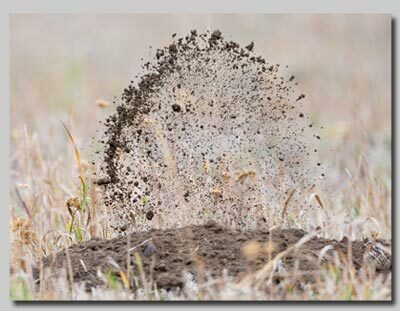 Linda suddenly spotted movement where earth was being tossed in the air by something about 100 metres away. Earth flying in the air! 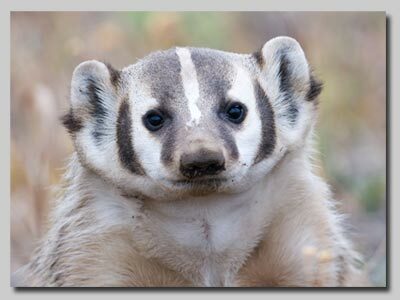 I thought I caught sight of an American Badger so went off to investigate with my camera. I crossed a small stream and soon got near to where the earth was still pluming skywards. after a while a badger stuck his head up and then started backfilling a hole with its hind feet. It peered at me and I got several good shots. During the next hour we saw it many times and I was surprised at how extensive a sett it had. We moved farther along the Lamar until we came to a bend in the river where some people were watching 2 golden eagles eating some kind of prey item beside the river. I got a few pictures before they both flew into a nearby dead tree which was unfortunately against the strong midday light. 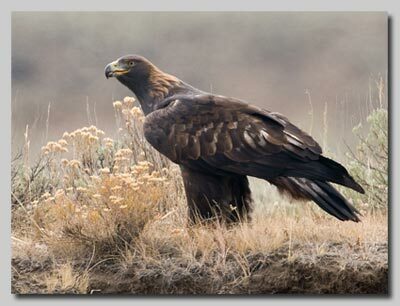 Golden Eagle near Soda Butte. We spent the rest of the afternoon in the Lamar and did have distant views of a wolf far away on the other shore where it had apparently been seen with 3 cubs. Before we drove back into Slough Creek we stopped a while and ran the generator to charge up our phones & camera batteries. As we stood outside the camper drinking coffee a stoat ran out in front of us and circled the camper at great speed with its black tipped tail held high. It came into rain early tonight although we did manage to get the burgers cooked on the campfire before being forced to retire to the camper for the evening. We did however have a good chat to a guy named Monty who we'd briefly met the night before. Monty was tenting and was keen to chat and as I'm rarely lost for words we got on fine. He is a retired forester from Oregon but sounded like he should have been a professor of mathematics as he kept coming out with many different statements about the park and indeed his home parks back home in Oregon. We were in bed by 8:30 p.m. although I was awoken at about 4 a.m. by water dripping on my face as somehow the earlier rain had welled up somewhere and forced its way into the vehicle. We awoke to find some mule deer amongst the scrub across the creek from our campsite. I did get a few shots although the light levels were fairly low. We then headed out along the Lamar valley, watching Pronghorn, a coyote & numerous bison along the way. We then headed back west toward Mammoth Hot Springs until we met a “bear jam” about a mile east of the Tower-Roosevelt junction. 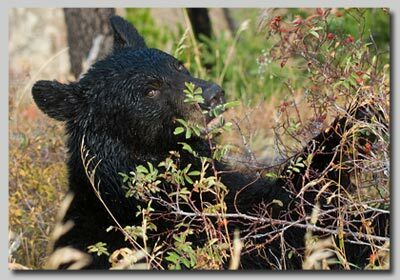 There was a black bear of maybe 2-3 years in age beside the road eating rosehip fruit. Many people were there but the bear was very close and was right beside the parking turnout maybe 20 feet from our camper. Linda kept the vehicle door open just in case we needed to make a quick exit should its temperament change. Unfortunately a Park Ranger came along shouting through her vehicle's megaphone and scaring the bear to hell! She closed down the parking area and tried to disperse everyone from the area. I'm sure she caused the bear much more distress than all the people had prior to this. I know she has a job to do and must safeguard the public but there are ”ways & means” of doing things. 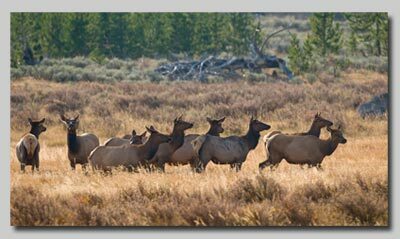 We drove on into Mammoth where elk were grazing all over the place, especially on the manicured lawns of the fancy town houses. There were 3 bulls that we saw and they were lying in the shade of the buildings but still able to bugle their sound around to all the females in the vicinity. 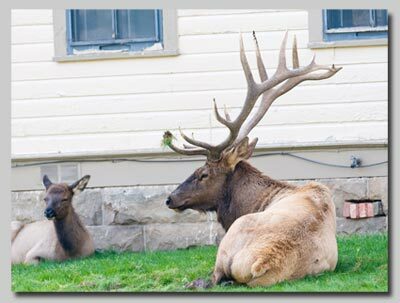 Elk lazing on the lawns at Mammoth Hot Springs. We managed to buy a few more food essentials to keep us going before heading back out to the Lamar. We saw all the usual sights and then headed down past the Soda Butte creek area until we found the moose in the same area as on Monday. There was a large bull with a good rack of antlers and a female and a juvenile. On the way back we stopped and watched as another storm was headed along the valley. We got the BBQ going amidst an amazing electrical storm as lightning flashed all around us. We were briefly joined by a guy we'd met yesterday called Jim. He was from South Texas and was still on a long road trip which he had begun back in mid-April. It had taken him north through Canada and into Alaska right up to the Arctic Ocean. So far he'd covered 19,000 miles in his old diesel truck with a camper unit perched on the top. He was a very interesting character with a “down-south” drawl but he hadn't let the grass grow under his feet and was still travelling back south toward Texas. 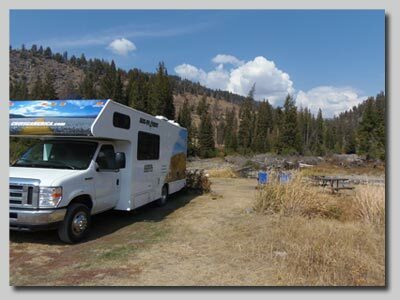 Jim had given us some valuable info about Alaska, the Kenai Peninsula & Denali national park.... more than enough to get us interested in making the Denali campground our home for a few weeks in the future. It was quite exciting to be sat around a roaring campfire in the pitch dark as forked lightning danced all about us. Fortunately we'd eaten and soaked up the atmosphere totally before the thundery rain started. This was the signal to retire indoors with a few tots of alcohol. We awoke to find 7 mule deer grazing amongst the sage brush near our campsite. I managed to get a few shots of them before they crossed the site and headed for the rocky bluffs to the east. 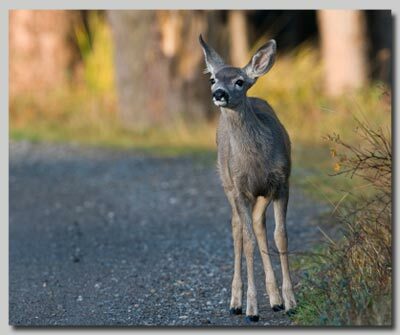 A Mule Deer fawn at Slough Creek campsite. 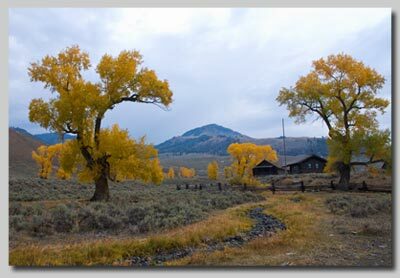 After breakfast we again headed out into the Lamar valley where we stopped near to the Ranger station and I photographed the cottonwoods in all their autumn glory with bison grazing and sleeping under their boughs. Cottonwoods at the Ranger station in the Lamar valley. A guy there told us that the wolves from the Lamar pack had been showing well down at the viewpoint near to the Soda Butte. 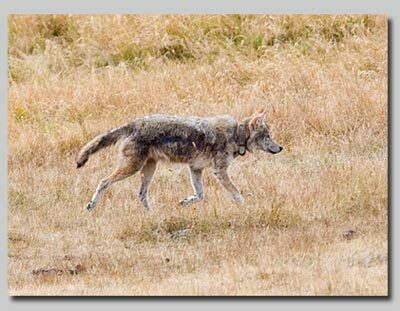 We went down there and were fortunate to see 2 wolves, 1 black & the other grey with black & grey facial markings. They were always distant... say about ¾ mile and not at all suitable for photography. It was still a treat to see them and I'm glad we brought the spotting scope with us from the UK. 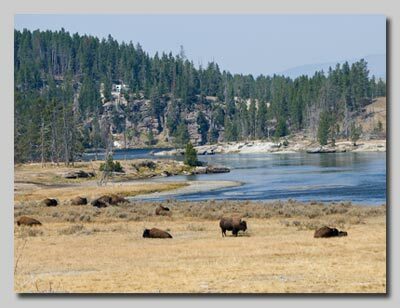 We stopped for over an hour near mid-day to watch and photograph one of the large bison herds in the Lamar as they were traversing the road and the bulls were doing a considerable amount of bellowing. It was good to try to identify all the members of the various family groups i.e. the bulls, the cows & their off-spring. 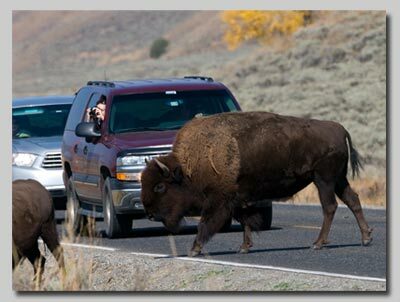 Bison crossing the road in the Lamar valley. We moved on later to Mammoth to get some fuel for the camper and to use the telephone as there was virtually no mobile signal in that area. I managed to get us a campsite at Madison again despite the tele-booking service saying that they were full! We then headed out toward West Yellowstone along the Madison River where we were fortunate to find 2 bald eagles on perches, one of which was eating a large fish at the top of a burnt pine tree. We also watched a young male “pricket” Elk on the far shore and I went back and got some shots of some elk cows as they fed in the marshy areas below the campsite. Steaks on the BBQ followed amidst the ongoing bugling of bull elk up the valley between the mountains. I walked the Madison meadows before breakfast and there was a bit of a frost with mist rising from the Madison river. 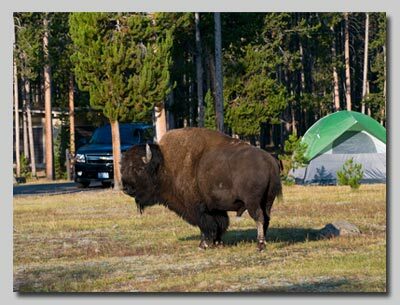 There were a few elk cows and a young bull on one of the grassy islands mid-stream and a huge bull bison was walking through the campground amongst all the tents in the lower part of the site. Bull Bison in the Madison campground. We left to do a circular tour of the south part of Yellowstone, setting out firstly for the Old Faithful area where we took some shots of the geysers throwing steam into the air against a backlit blue sky. Old Faithful had just erupted a few minutes before we arrived so we just picked up some items from the store and wound our way on to West Thumb, crossing over the Continental Divide at an altitude of 8390 feet. We turned toward Bridge Bay and along the shore of the Yellowstone Lake until there was a hold up on the road... a huge bull elk just walking along the centre of the road. I got some shots of him as he just wandered off into the forest and we wondered how he managed to negotiate his way through the trees and heavy undergrowth with the huge rack of antlers that he had. 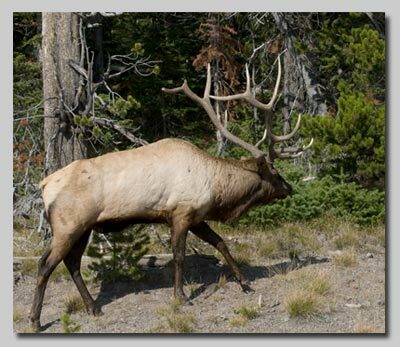 A bull Elk along the road around the shore of the Yellowstone Lake. We moved on to the Fishing Bridge area and pulled up overlooking the Pelican Creek which is famous for its Grizzlies.... but perhaps not today! I hadn't realised the altitude of the Yellowstone Lake was so high at 7792 feet. No bears but Linda did spot a cracking Belted Kingfisher perched on a piece of dead driftwood in the middle of the stream. Too far away for a photo but it looked great when we got the telescope on it. This is a bird with a strong association with Wadebridge as there have been 2 vagrants of this species found blown across the Atlantic with the sightings being 77 years apart. We carried on our loop and stopped at the rim of the Upper Yellowstone falls for a few pics and then on via Canyon, Norris & back to Madison at a lower elevation of 6806 feet. We were met with some more afternoon thunderstorms and a few hails. It looks like we will be cooking & eating indoors tonight.